Norman Douglas, the third son of John Sholto Douglass (1838–1874), mountaineer and archaeologist, and his wife, Vanda (1840–1902), daughter of Baron Ernst von Poellnitz, was born in Thüringen, Austria, on 8th December 1868. When Douglas was five, his father was killed in a mountaineering accident, and in 1876 he was sent to be educated at Yarlet Hall School near Stafford. In 1881 he was sent to Uppingham School. He was very unhappy at Uppingham and later admitted he warned his mother that if he was not removed from the school he would arrange to be expelled for "sexual malpractice". This worked and in 1883 he was sent to the Karlsruhe Gymnasium. He developed a strong interest in natural history and began contributing scholarly articles to The Zoologist, a journal edited by James Edmund Harting. When Douglas reached the age of 21 he entered the Foreign Office, and was posted to St Petersburg. In 1891 he was promoted to third secretary. While in Russia he continued to contribute to natural history periodicals, and published two books, The Herpetology of the Grand Duchy of Baden and On the Darwinian Hypothesis of Sexual Selection. In 1896 he resigned from the Foreign Office. According to Alastair Brotchie, "Douglas... got thrown out of the British diplomatic service. He was having affairs with three aristocratic Russian women at once and got one of them pregnant. He had to leave St. Petersburg because he was in danger of being killed by the family, who were related to the Romanovs." His biographer, Katherine Mullin, claims that the young girl's name was Helen Demidoft. Mullin adds that Douglas now bought a villa at Posilipo in the Bay of Naples, "intending to dedicate himself to botanical studies and travel." On 25th June 1898 Douglas married his cousin Elizabeth (Elsa) FitzGibbon (1876–1916), the daughter of Augustus FitzGibbon, at Fulham Register Office. Elsa was two months pregnant and the marriage was arranged very quickly. They lived in Italy, where their first child, Archie, was born, and a second son, Robin, the following year. Douglas obtained a divorce in 1904 on the grounds of Elsa's adultery and gained custody of their two sons. Douglas moved to Capri, sending his sons to boarding-school in England. In January 1905 Joseph Conrad visited the island for several months, and the two became friends. In January 1908 he moved to London where he successfully contesting his wife's attempt to regain custody of her children on the grounds of her husband's paedophilia. According to Mark Holloway, the author of Norman Douglas: A Biography (1976), his wife claimed in court that he was involved in a "rather faunesque pursuit of young boys". Over the next few years Douglas was a regular contributor to the The Cornhill Magazine and The English Review. He joined the literary scene and became friends with Edward Thomas, Rupert Brooke, Compton Mackenzie and D. H. Lawrence. 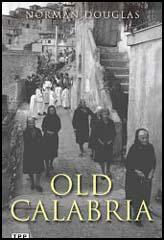 Douglas was also the author of three books during this period, Siren Land: A Celebration of Life in Southern Italy (1911), Fountains in the Sand (1912) on Tunisia, and Old Calabria (1915), rugged mountains and windswept coastlines facing Sicily. This was followed by London Street Games (1916), a book inspired by his conversations with teenage boys in London. In 1916 Douglas was arrested and accused of paedophilia. According to his biographer, Katherine Mullin: "In 1916 a darker aspect of Douglas's interest in young boys became evident when he was arrested and charged with sexually assaulting a sixteen-year-old boy. In January 1917 he was charged with further offences against two brothers aged ten and twelve. On the advice of Compton Mackenzie, Joseph Conrad, and other friends, he broke his bail conditions and returned to Capri." While in Capri he completed the manuscript of the novel South Wind (1917). The sexual content of the book caused a great deal of controversy. However, its questioning of conventional morality was praised by Virginia Woolf in the Times Literary Supplement. Douglas joined a group of expatriate artists and intellectuals that included D. H. Lawrence, Somerset Maugham, Compton Mackenzie, Francis Brett Young, Axel Munthe, Filippo Tommaso Marinetti and Maxim Gorky. In 1920 Douglas moved to Florence, where he lived with the Italian bookseller Pino Orioli, who was later the publisher of Lady Chatterley's Lover. Over the next few years Douglas published two novels, They Went (1920) andIn the Beginning (1927). The following year he produced Some Limericks (1928). Douglas admitted that it was "one of the filthiest books in the English language". An autobiography, Looking Back, appeared in 1933. His biographer, Katherine Mullin, points out that "in 1937 Douglas was forced to flee Florence after the police made enquiries concerning his friendship with a ten-year-old local girl." For a while he lived in Lisbon but moved to France in 1940. After the death of Pino Orioli he returned to London where a second edition of South Wind was published. After the Second World War he went to live in Capri. His health was poor and he died on the island on 7th February 1952. Back then it was a bit medieval, you could just buy a girl. You gave the family some money and they gave you their daughter, and it was just accepted. It was a bit like Bangkok, extremely dubious. So he had this relationship with a girl he’d bought from a family, but the brother got uptight about it and one evening, when Douglas walked into an alley, the brother followed him and gave him a good beating. Douglas went to the family and complained and they agreed it was outrageous, the brother had completely dishonored them. So then, Douglas falls in love with the brother and after that was mostly homosexual. True romance. He went back to England briefly to work on the English Review but left again over some scandal involving him pressing his lust on a young man. This was so typical then, these English aristocrats going abroad, creating mayhem and shagging anything that walked. Capri was this weird place where all these sort of people hung out. Somerset Maugham was there. He was basically in the same situation, he had a wife who ignored all his exploits with the house boys.